It was with considerable regret that I learned of the closure of one of Dublin’s oldest bookshops. It was a place of comfort – a second home – to those who spent time browsing the crammed shelves and enjoying its unique bookish smell. Oddly, there was a Post Office at the bottom of the creaky stairs and that meant there were always the din of quiet conversation adding to the atmosphere. And, of course, there were the familiar green, book trays that were carried outside the shop each morning and left under the glass canopy. These were packed with bargains, and never failed to attract eager readers. I often sought shelter under the protective canopy when it rained, and dipped into the rows of books as the rain rat-tat-tatted on the glass above. The place was a sanctuary for both mind and body – something that is badly needed in these hectic times. 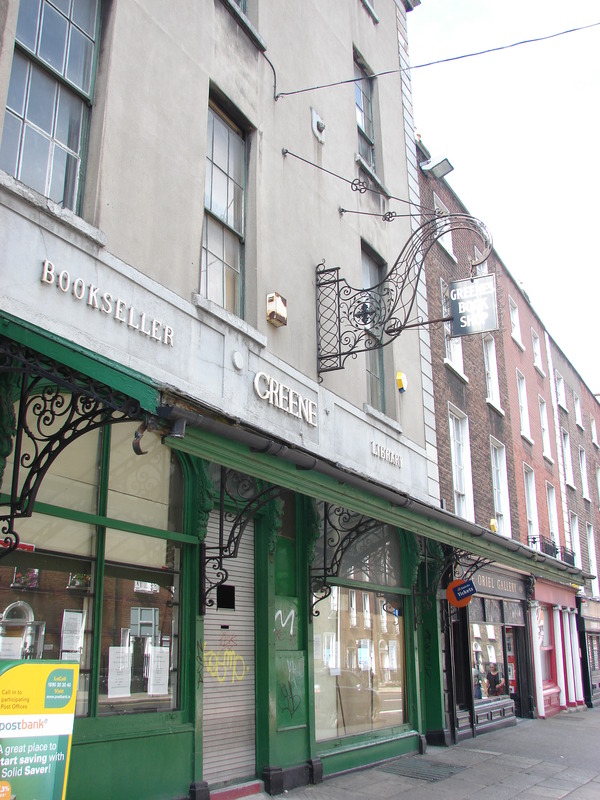 The shop, opened by John Greene on Clare Street, had been selling books since 1843, and that’s an awful lot of books however you decide to measure it. 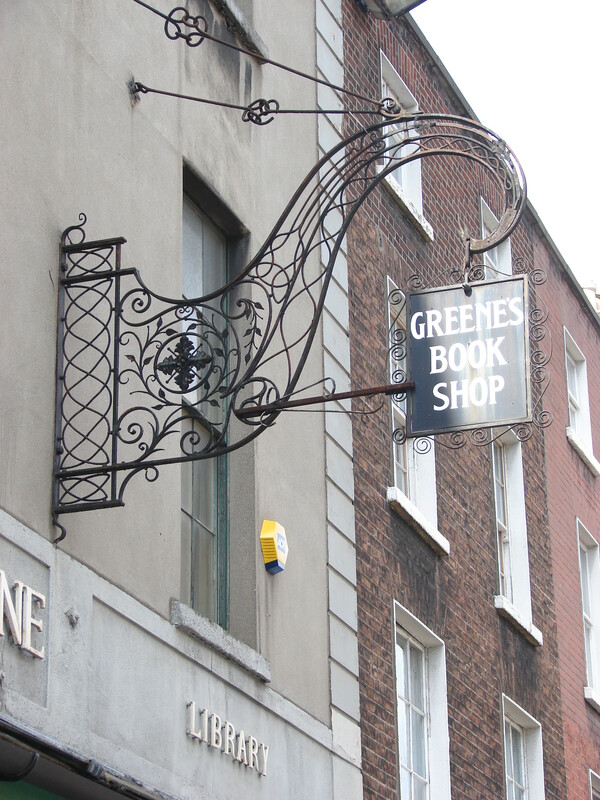 Whether one was buying schoolbooks for the next academic year, something that usually involved joining a queue that snaked its way around onto Merrion Square, or just looking for something to read while on holiday, Greene’s was the place to begin. And, due to its great selection, often where the search ended. The moment of discovery was everything and I will never forget coming across a signed copy of The Mysterious Affair at Styles by Agatha Christie. I was only eleven or twelve at the time and had just begun reading her stories. Since then I have read many of her books with her character Hercule Poirot being a particular favourite. My book was a source of pride for years until I met a professor of English who was keen to see it. A week later when I visited him in college he burst my literary bubble when he turned the front cover over. ‘Ahh,’ he said, making a face. The author’s ‘autograph’ was not like the real thing, he told me. It was a fake! And that the book was worthless! Which, of course, it wasn’t. The book had been a great read, a gem by one of favourite authors, and one that I was always happen to recommend. The book that I had bought all those years before was certainly old and cheap, but worthless – never! Like all institutions, and for many of us Greene’s was one, the time had come for it to close and turn the final page. It had brought joy and happiness to generations of booklovers and will forever proudly take its place in Irish literary history. Oscar Wilde lived across the road at No. 1 Merrion Square and often dallied there, as only he could, amidst the musty tomes stacked precariously on creaking shelves. Patrick Kavanagh was a regular, as was Samuel Beckett who, for a time, lived in an attic above his father’s office across the street. The story ends and, like all good ones we are left with a sense of wonder, enjoyment and of something deeply satisfying. 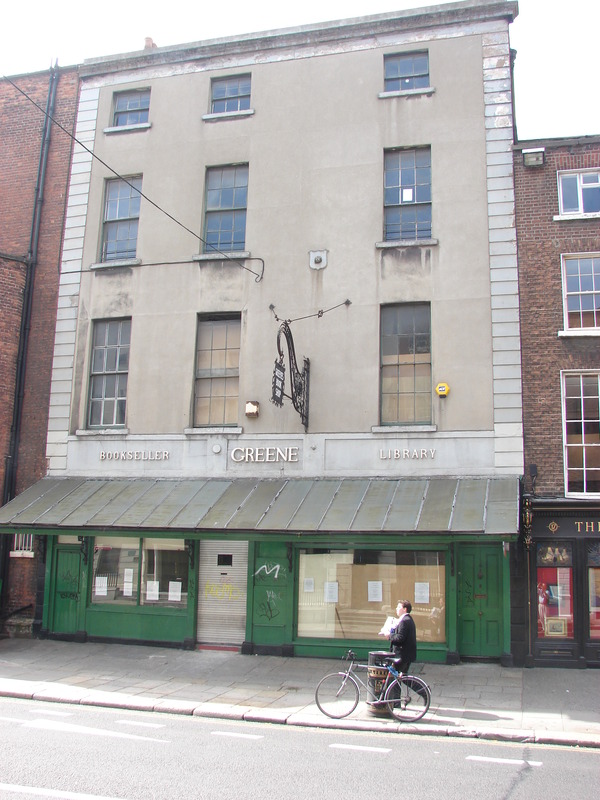 Sadly, the bookshop is gone, but the story of Greene’s will live long in the memories and hearts of those who entered its friendly embrace, and therein found new worlds to explore, experience and enjoy.